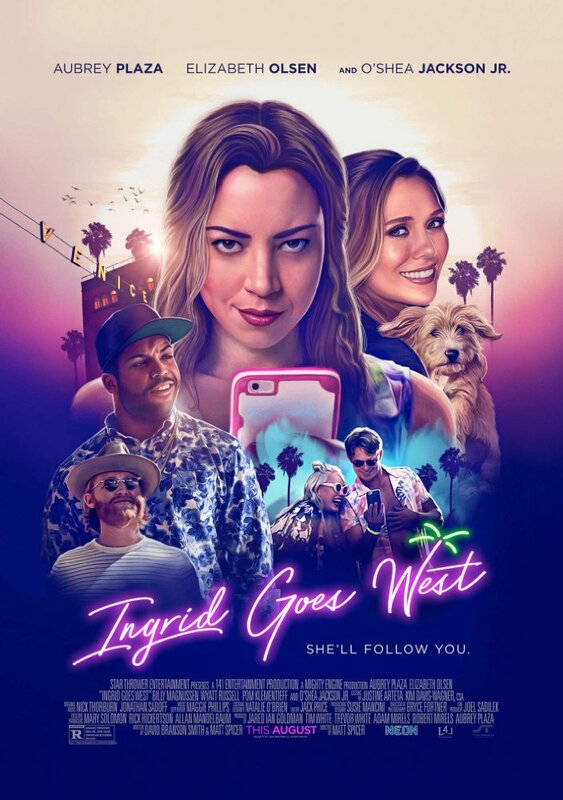 Aubrey Plaza plays Ingrid in this week’s new release Ingrid Goes West. Ingrid is a slightly-unhinged young woman who has a tendency to mistake social media for the real world and obsess over celebrities and “influencers,” envying their life and engaging in a bit of stalking that goes beyond the mobile world of Instagram. Upset over a recent situation gone bad, Ingrid latches onto her latest obsession: Taylor Sloane (Elizabeth Olsen), a new influencer in California who’s become famous for her bohemian lifestyle and perfectly-lit and filtered photos and other media. Ingrid ingratiates herself into Taylor’s life and while the two initially become friends things quickly spiral as Ingrid’s true motivations are uncovered and unstable nature comes back out. The first poster crops Ingrid out of the picture, meant to look like a selfie with Taylor and therefore setting up the story pretty nicely. The movie’s Sundance credentials appear at the top and we’re asked “Do you want followers?” which sets up, along with the promise that it’s coming soon to our feed, that we’re dealing with a story set in the world of social media. The pink hue and the neon lettering used for the title on the next poster hint that we’re dealing with something related to the entertainment industry. We see Ingrid with a photo of the subject of her stalking clenched in her teeth, an image that’s meant to invoke a level of less-than perfect mental health. That’s amplified by the copy “Obsess much?” at the bottom. It’s an OK effort, but there’s not much you can do to really summarize the concept in a single image. One more poster leaned even harder into the social media aspects of the story, showing Ingrid’s face as a series of differently-toned boxes, all in a frame that looks like what you’d see on Instagram. The first trailer is insane showing how Ingrid goes nuts on a celebrity she may be stalking when not invited to her wedding. Ingrid’s becomes obsessed with Taylor but she invites the rabid fan into her life. Much of the trailer is just people exclaiming they can’t believe how insane or otherwise crazy Ingrid in and it’s hard to argue with that. The theatrical trailer opens in roughly the same way, with Ingrid breaking up with her current stalkee in dramatic fashion. She’s got a new obsession and goes to California to be close to Taylor, stealing her dog in order to ingratiate herself more into Taylor’s life. It’s not long before they’re hanging out regularly. Ingrid has to work to keep up the con and her secret is eventually at least partially exposed. Wow, that looks DARK. Plaza is perfect in this as the obsessed fan with a tenuous grasp on reality and the story looks like it takes her into some interesting places. Very much a black comedy being sold here and the additional running time and new structure gives a much better idea of the story and the motivations of the characters. An emoji trailer was released on World Emoji Day that just took the first trailer and added emojis corresponding to the action to the bottom of the screen. There was one more red-band trailer released that starts out with Ingrid offering to pay a group of kids to punch her in the face, apparently to get a bruise she can use for some reason. From there it’s some of the same beats we’ve seen before of Ingrid moving to L.A. and meeting Taylor, soon to be discovered as a stalker by those close to Taylor. To maintain her secret she works with a new friend to beat people up and so on. There’s not a whole lot going on over at the movie’s official website. A cropped version of the key art appears at the top of the single-page site, with prompts to buy tickets or connect with the movie on Twitter, Facebook or Instagram are at the top. Also there is “Emojis,” which just lets you watch the special trailer created for World Emoji Day. No paid efforts I’ve caught or am otherwise aware of. There might have been some social advertising done with one of the trailers, but that’s all I can think of. The first bit of publicity came when it was announced the movie would have its official premiere at Sundance 2017. After the reaction to that screening was generally positive, with word-of-mouth swirling quickly over its twisted and dark nature, it’s not surprising it was quickly picked up for distribution by Neon in one of its first big acquisitions. There was a nice bump when it was announced the movie would close the L.A. Film Festival this year. The two costars had a bit of thematic fun by “twinning” with matching outfits at the movie’s premiere, resulting in lots of press coverage. Plaza talked here about how while the social media-centric nature of the story might make it seem very “of the moment” it’s also timeless in its theme of obsession and defining yourself. For her part, Olsen talked about balancing smaller movies like this with the bigger Marvel franchise she’s also involved with while director Matt Spicer called her the perfect choice for a role like this. There were also a couple interviews like this one where the two actresses appeared together to comment on social media, working together and more. For all the talk in the publicity by the stars and director about how they didn’t want to get bogged down in the social media aspects of the story but make it more all-encompassing, the rest of the marketing is all about emphasizing social media. Not only do the trailers use images of Instagram liberally to share Ingrid’s skewed view of the world but the posters double down on that by occasionally bringing in elements that make it look like they themselves are coming from the world of social sharing. The campaign works better when it focuses on two things: 1) Ingrid’s unhinged behavior, captured wonderfully by Plaza and 2) The bright lights of Hollywood and California. This may betray my personal outlook, but I’m less interested in the stalker than the new over-sharing culture that makes such stalking so easy and can lead to the kinds of artificial attachments that often turn dangerous. When that’s the story that’s being sold, the campaign fires on all cylinders and seems like a bit of interesting societal commentary.